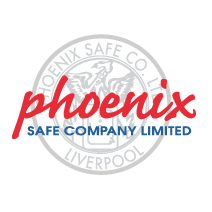 Whilst our range of safes are perfect for protecting the possessions you care about most, we think your home should be considered the safe that you just happen to live in. So here are 5 reasons why you should consider installing a home security system. 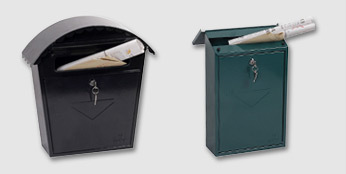 If you have a safe at home, the chances are you keep your most prized possessions in there at all times. 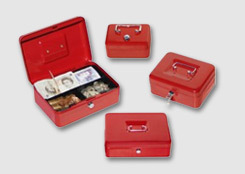 Unfortunately you can’t fit everything in your safe, and the possessions of your safe are not the only things that will be an attractive target to thieves. Technology, household goods, small appliances and many other things in your home are at risk of theft, so it’s definitely worth considering installing a security system in your home. It’s not just about protecting the possessions in your home, however. It’s also about protecting yourself, the people (and pets) you love, too. 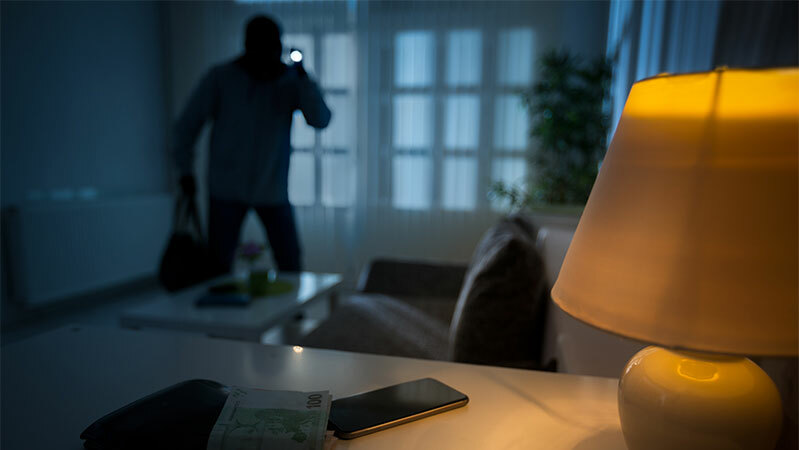 Whilst thieves are more likely to target your home when you’re not there, it’s also entirely possible that they could target your home whilst you’re sleeping. Having an alarm installed and knowing that you have a basic level of protection for your home, everyone and everything inside it will hopefully help you sleep that little bit better at night. Having visible signs of an alarm system outside of your home is a good deterrent to thieves planning to break into your home, and potentially your neighbours homes too. Research published by the POLICE.UK shows that homes without an alarm are 5 times more likely to be burgled! 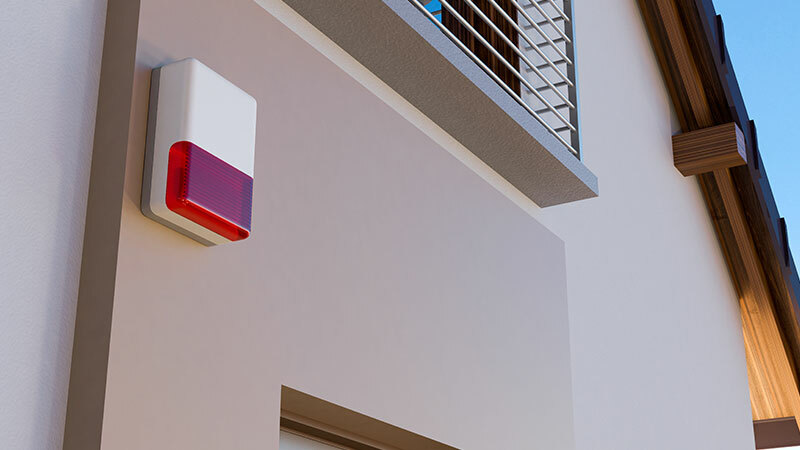 Alarm systems that periodically light up to let potential thieves know that they’re active is definitely an attractive additional feature. Some home security systems now also come with a small sign you can place on the grass in your front garden to highlight the fact that your house is protected. The more protection you have the less likely you are to be burgled, so because of this some home insurance providers will lower your home insurance premium if you tell them that you have a burglar alarm or other security system installed. A discount on your home insurance isn’t guaranteed, and the amount of discount can vary from provider to provider depending on various factors, including the system you install, so it’s best to check first. Finding out what reductions you could receive is definitely worth doing, as this saving could also help pay for the cost of installing the system itself. Some people report that they have saved up to 20% on their home insurance by having an alarm system installed! Having a security system installed for your home is a nice feature for your own piece of mind – but also potentially for the next people that could move into your property, should you ever choose to sell. n fact, 61% of potential homeowners said that having a secure home was a must have property feature. Did you know that having a security system installed on your home can also increase the value by up to £3,500? If you combine that with lower home insurance it makes for a more tempting proposition for buyers. No matter where you are, whether you’re at work or on holiday on the other side of the world, you can be assured that your security system is there to deter burglars and keep your possessions safe. If you have cameras installed as part of your security system, they now even allow you to monitor your home, live from anywhere in the world using phone apps. With features like motion detection and built in speakers, you will be instantly notified of any movement in your home and if there is an intruder you can alert them that you’re aware of their presence – which is a fantastic deterrent to startle the thief and encourage them to leave. Nobody likes the panic of worrying that you’ve left your house unsecured, but a security system can give you that extra piece of mind. 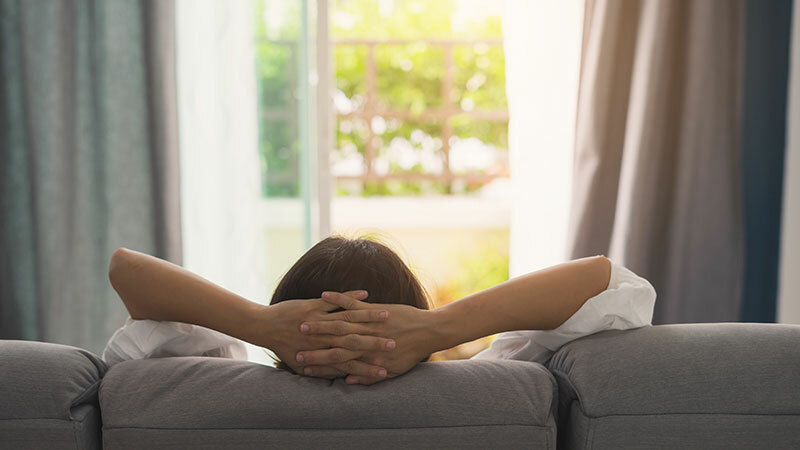 Of course burglars and other intruders aren’t the only threat to your home, so here are 3 extra alarms you can add to your home for added protection. This seems like an obvious one, but did you know 25% of homes still don’t have a smoke alarm? Some local councils in collaboration with their fire service will fit and test smoke alarms for free, so it’s definitely worth checking if this is something that’s available to you. Beyond basic smoke alarms however, there are now smart versions which will also alert you immediately when they’re activated. Combine this with a camera system and you can instantly see if someone has burnt a piece of toast or if something more serious is happening at home. Most modern smoke alarms now also incorporate a carbon monoxide detector which can protect you from gas leaks too! If you don’t live in an area that’s prone to flooding, you may not have ever considered a water sensor in your home, but did you know that 1 in 2 homes has experienced water damage? It’s not flooding but rather burst pipes which are the worst culprit, and 65% of water related incidents are caused by them! Smart water sensors are a fairly new device coming onto the market that you can place throughout your home, in places such as your bathroom or your kitchen (or near your safe) and they will alert you when they come into contact with water. Water damage can cause thousands of pounds worth of damage to your property, so it could be worth investing in water sensors, so that you can be alerted and hopefully put a stop to the flood sooner rather than later – potentially saving yourself a small fortune. Previously we mentioned that thieves won’t just target your home when you’re away, but could even try and gain entry when you’re home too! 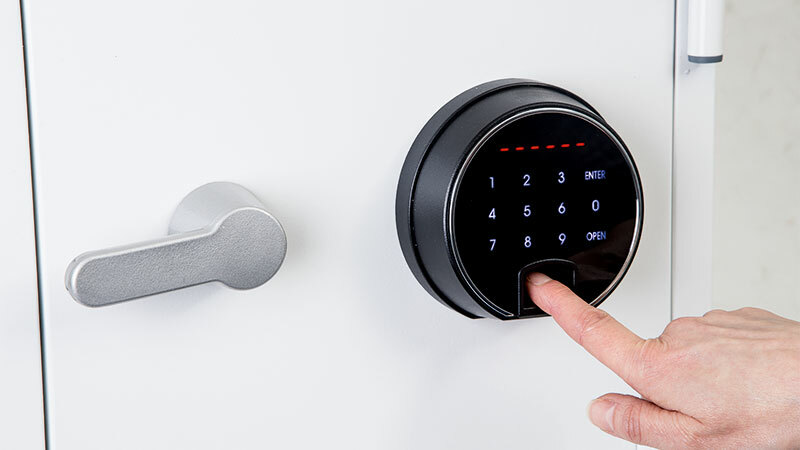 If you are considering purchasing a safe for your valuables, our Titan Fire and Security range with Fingerprint Locks include an alarm that triggers when the wrong code is entered multiple times. 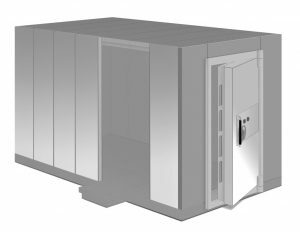 Besides the fingerprint lock, Titan safes also have plenty of additional features to keep your contents secure, including fire and drop protection and an insurance rating of up to £2,000 in cash or £20,000 in valuables. In the event that a thief would manage to gain access to your home, if you have a safe in your home office downstairs for example, and your home becomes a target to thieves who try to gain access to your safe – entering the code incorrectly and setting off the alarm could alert you or your neighbours of their presence. In week 2 we’ll focus on Security Standards and what you should be looking for when purchasing security equipment for your home! Follow us on Facebook or Twitter to keep updated with the rest of our posts related National Home Security Month.